HardKernel unveiled the ODROID-X development board based on Samsung Exynos 4412 quad-core ARM Cortex-A9 with quad core Mali-400 GPU, 1 GB Low Power DDR2 and storage is done via SD card and/or eMMC flash. 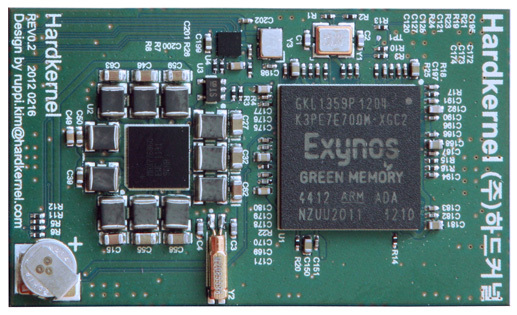 The Exynos4 CPU module is soldered on the board and is not detachable. The CPU module embeds the LPDDR2 RAM 8Gbit (POP), a PMIC (MAX77686), a HSIC-USB Hub (USB3503A) and measures 43 x 25 mm. 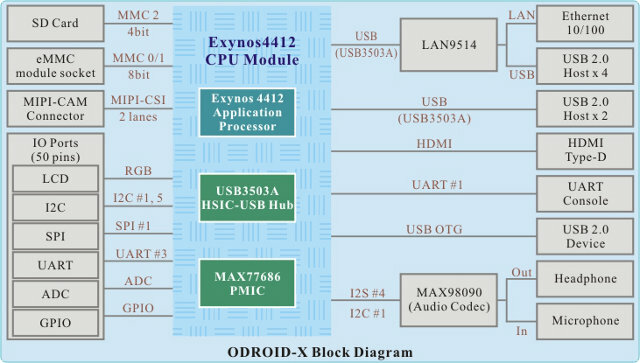 You can have a look at the board block diagram for a system overview, see connection and which chipsets are used. The company provides an Android 4.0.4 SDK and is working on an Ubuntu 12.04 port (GPU hardware acceleration is still missing). The platform source code (u-boot, kernel and Android) and documentation will be available on HardKernel Downloads page once the boards ship out. You’ll be able to obtain the board and CPU module schematics once you receive the board, but not the gerber or layout files. Watch the video below for an overview of the board and demos of its capabilities with Android. ODROID-X can be purchased now on Hardkernel eStore for $129 (+ $30 shipping) and will be shipped by the end of July. Korean can pay 150,000 Won for the board. AFAIK, this is the cheapest quad core Cortex A9 board available today by a fair margin (The cheapest Freescale i.MX6 board is $199). Those modules appear to be fairly standard, so you may procure via other means. They also offer cables (HDMI, USB…), SD card and power supply, but you might be better off buying those locally although their prices are reasonable. 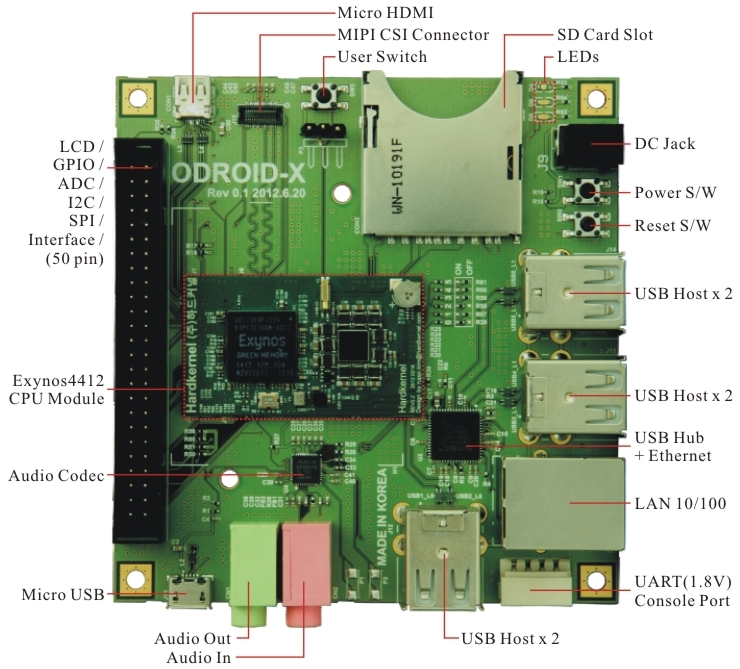 You can find more information on HardKernel ODROID-X page and on their forums. As I know the Exynos-4412 is a heart of Samsung Galaxy-S3 smartphone. I wanna get one for my personal project. I’ve ordered one due to this video. There are 4 webcams HD-MJPEG streaming in parallel. It was around $250 when included 13.3inch LCD kit and a few connectivity accessories.. I hope it is worthy and handy. POP memory (Package in Package).. so it’s packaged with the CPU, impossible to upgrade. I enjoyed a lot of thing with RPi even it has only 256MB. So, 1GByte should be more than enough in most cases..
What do you want to do 2Gbyte or more memories? They should start making these things with 1 Gb memory per core. Now you have a quad core, but basically still only 1 Gb memory. It just sounds strange to me. Up until last year, my desktop PC (running Windows XP) had 1 GB of memory and was working fine (for most tasks), and I’ve just added more memory to be able to use virtual machines running Linux smoothly, and be able to run Excel, Word, Gimp, Firefox and Thunderbird simultaneously without slowdown. For an embedded system, 1 GB RAM is still plenty of memory, and the limitation is not that bad, as it may prevent people from writing bloated software. If the target audience is mobile developers, then that’s also fine, because most smartphones and tablets have 1GB memory max. Only a handful tablets have 2 GB memory. But you are not the only one to complain about the lack of memory, so I must have missed something. I agree with all that 1GB is sufficient. But my point is entirely different. We have opened the software for ARM. The time has come to open the hardware. Where are my ARM boards? where I can configure my own hardware. Like I do with my x86 machines. And there is huge market out there for this. Option guys Options, Where are my options. I am looking at you my dear ARM hardware manufacturers. I’ve never seen RAM modules for ARM, those are usually soldered on the board or packaged with the SoC (PoP), but this could be an idea, although added flexibility would also increase the price. If you want flexibility in the ARM space, you can use CPU modules which come with CPU + RAM and possibly some other components, but it’s more for the industrial and developers side of things, than a consumer option, and usually it’s not cheap. Some times I feel like I should get into this hardware manufacturing thing. Add $20 seller margin etc. So in around $100 you got some crazy hardware, Throw few pieces in few tech forum for developers and they’ll go crazy. And you’ll crazy sales. Community will get good hardware in decent pricepoint with open Modding options. I want to manufacturer something like this, But the problem is I don’t have the required money and technical skills to achieve this. Only the ideas can get you this far. Posting on a blog. 🙂 Sigh! What above cost of developing your board? Support costs? bad boards that don’t work? inventory costs? Paying for your time? Unsold inventory when its obsolete next year? Is there any JTAG which we can use with this board for debugging the SMP issues.? If yes please suggest me. AFAIK, there’s no JTAG on this board. Thanks for replying to my email. One more question, then how can developer debug with hardware watch points and reflash if boot and flash routines get corrupted. I have not a good answer for hardware watch points, but I understand the boot code is inside Exynos internal ROM. The guys at hardkernel should be able to give a better answer.